Mark Hale and Charles Reiss (2008). The phonological enterprise. Oxford & New York: Oxford University Press. Pp. xii+292. Anttila, Arto (2002). Variation and phonological theory. In Chambers, J. K., Trudgill, Peter & Schilling-Estes, Natalie (eds.) The handbook of language variation and change. Oxford: Blackwell. 206–243. Blevins, Juliette (2004). Evolutionary Phonology: the emergence of sound patterns. Cambridge: Cambridge University Press. Boersma, Paul (forthcoming). Modelling phonological category learning. In Cohn, Abigail C., Fougeron, Cécile & Huffman, Marie K. (eds.) Handbook of laboratory phonology. Oxford: Oxford University Press. Bresnan, Joan & Deo, Ashwini (2001). Grammatical constraints on variation: ‘be’ in the Survey of English Dialects and (stochastic) Optimality Theory. Ms, Stanford University. Bresnan, Joan, Deo, Ashwini & Sharma, Devyani (2007). Typology in variation: a probabilistic approach to be and n't in the Survey of English Dialects. English Language and Linguistics 11. 301–346. Clark, Alexander & Lappin, Shalom (2011). Linguistic nativism and the poverty of the stimulus. Malden, Mass. & Oxford: Wiley-Blackwell. Coetzee, Andries W. & Pater, Joe (forthcoming). 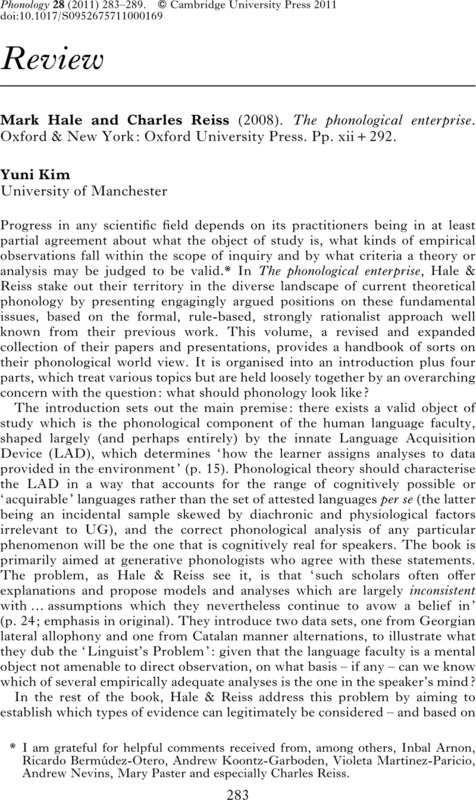 The place of variation in phonological theory. In Goldsmith, John A., Riggle, Jason & Yu, Alan (eds.) The handbook of phonological theory. 2nd edn. Oxford: Blackwell. de Lacy, Paul (2009). Review of Hale & Reiss (2008). JL 45. 719–724. Fikkert, Paula (1995). From phonetic categories to phonological feature specification: acquiring the European Portuguese vowel system. Lingue e Linguaggio 4. 263–280. Fikkert, Paula & Levelt, Clara (2008). How does Place fall into place? The lexicon and emergent constraints in children's developing phonological grammar. In Avery, Peter, Dresher, B. Elan & Rice, Keren (eds.) Contrast in phonology: theory, perception, acquisition. Berlin & New York: Mouton de Gruyter. 231–268. Flemming, Edward (2001). Scalar and categorical phenomena in a unified model of phonetics and phonology. Phonology 18. 7–44. Hale, Mark & Reiss, Charles (2008). The phonological enterprise. Oxford & New York: Oxford University Press. Hay, Jennifer (2000). Causes and consequences of word structure. PhD dissertation, Northwestern University. Frans, Hinskens, van Hout, Roeland & Wetzels, W. Leo (eds.) (1997). Variation, change and phonological theory. Amsterdam & Philadelphia: Benjamins. Johnson, Keith (1997). Speech perception without speaker normalization: an exemplar model. In Johnson, Keith & Mullenix, John W. (eds.) Talker variability in speech processing. San Diego: Academic Press. 145–165. Kapp, Reginald O. (1958). Ockam's Razor and the unification of physical science. The British Journal for the Philosophy of Science 8. 265–280. Krämer, Martin (2010). Review of Hale & Reiss (2008). Lingua 120. 176–182. Labov, William (1994). Principles of linguistic change. Vol. 1: Internal factors. Oxford & Cambridge, Mass. : Blackwell. Marcus, Gary F. (1993). Negative evidence in language acquisition. Cognition 46. 53–85. Ohala, John J. (1983). The origin of sound patterns in vocal tract constraints. In MacNeilage, Peter F. (ed.) The production of speech. New York: Springer. 189–216. Petrova, Olga, Plapp, Rosemary, Ringen, Catherine & Szentgyörgyi, Szilárd (2006). Voice and aspiration: evidence from Russian, Hungarian, German, Swedish, and Turkish. The Linguistic Review 23. 1–35. Pierrehumbert, Janet B. (2001). Exemplar dynamics: word frequency, lenition and contrast. In Bybee, Joan & Hopper, Paul (eds.) Frequency and the emergence of linguistic structure. Amsterdam & Philadelphia: Benjamins. 137–157. Polka, Linda & Werker, Janet F. (1994). Developmental changes in perception of nonnative vowel contrasts. Journal of Experimental Psychology: Human Perception and Performance 20. 421–435. Smolensky, Paul (1996). On the comprehension/production dilemma in child language. LI 27. 720–731. Steriade, Donca (1997). Phonetics in phonology: the case of laryngeal neutralization. Ms, University of California, Los Angeles. Available (April 2011) at http://www.linguistics.ucla.edu/people/steriade/papers/phoneticsinphonology.pdf. Werker, Janet F. & Tees, Richard C. (1984). Cross-language speech perception: evidence for perceptual reorganization during the first year of life. Infant Behaviour and Development 7. 49–63.